When a bearish candlestick pattern shows up on a stock chart, it doesn't always mean that it is bearish. It depends if there is follow through or not. If there is no follow through, then you can enter a stock and profit from other traders caught on the wrong side of a move. 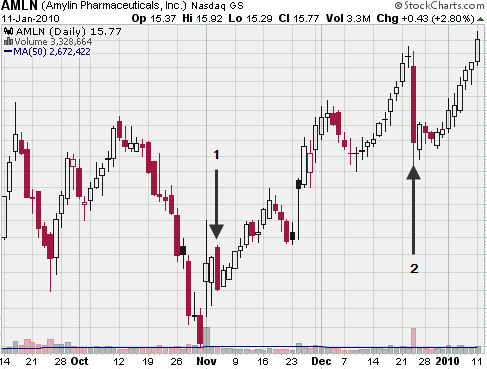 The first example on this chart (1), shows a bearish engulfing pattern. This candlestick pattern was indeed bearish on that particular day and there were probably many traders that shorted this stock. But, there was no follow through to the downside the next day. The lack of follow through is not at all suprising considering that there was a bullish kicker candlestick pattern prior to the engulfing candlestick pattern! The second example (2) shows a very bearish candle on high volume. This one candle completely wiped out the prior up swing. But, there was no follow through to the downside on the next day. In both of these examples, the stock rallied and caught the majority of traders on the wrong side of the move. So, how can you trade a stock like this and profit from other traders mistakes? 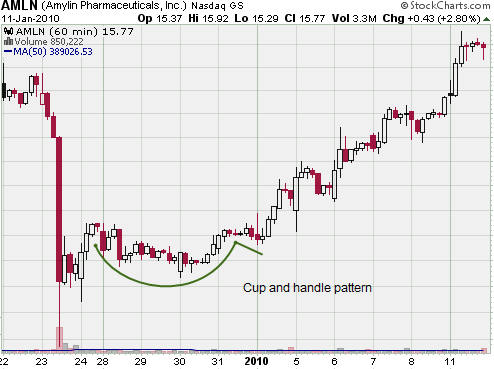 The hourly time frame developed a nice cup and handle pattern. You can buy the breakout here with a very tight stop loss order. And a big advantage to buying into a stock like this is that the next resistance level is far away. This makes for an excellent risk to reward trade. My mother is a recovering alcoholic. She's been sober now for 20+ years. Not only did she beat that awful addiction to alcohol, but she made it her profession. She went on to become an alcoholism and drug counselor. Over the years, she's helped hundreds (maybe thousands) of people overcome their addiction to alcohol and drugs. She is retired now but still holds a group once a week to help others with their addictions. There is no telling how many people owe their life to my mother. She is an amazing woman, indeed! That one little sentence was scattered all over our house. It was on printed on paintings, pictures, coffee mugs, t-shirts...everywhere! Not only was it printed on just about everything in our house, but every time there was a problem in our family, my mother would chant those words, "God grant me the serenity...". My brother and I became really annoyed by this prayer. Every time my mother got a new picture with the Serenity Prayer on it or say those words aloud we would roll our eyes! I'm older now. I'm married and have a house of my own. You would think that I wouldn't have anything in my house with the Serenity Prayer on it. You would be wrong. Right above my desk is a Thomas Kinkade painting called, The Garden of Prayer. And, it has the Serenity Prayer on it! I didn't understand the significance of this prayer when I was younger. But I do now. It's amazing how this prayer can help you with all kinds of problems - including trading stocks. There are things that you cannot change as a trader. 1. You can't avoid losses. Everyone has losing trades. That's just part of the game. Learn to accept that or quit trading. Simple as that. 2. You can't predict what the market will do. Forget trying to predict what the market will do in the future. There are too many factors that can influence the direction of the market. Prediction is not necessary, anyway. You can't change the fact that you will have losing trades, but you can avoid having big losses. Being able to take a small loss versus letting a trade turn into a big loss is the hallmark of a seasoned trader. You can't change the fact that the market will be unpredictable, but you can follow the direction of the market. Yes, at some point you will be wrong and the market will tank - and you may have a losing trade (see number one above). Having the wisdom to know the difference between what you can change about your trading (and what you cannot) will go a long way towards eliminating the stress and anxiety that seems to get in the way of making sound trading decisions. Then you can trade with the calm serenity of a professional trader. All you have to do is chant those words: "God, grant me the serenity...". That's what my mom would do.